The Asian Development Bank's (ADB) assistance to Cambodia rests on deepened rural–urban–regional links, and human and social development as strategic pillars; and enhanced public sector management as a crosscutting pillar. ADB has been supporting the Government of Cambodia since 1966 and is the country’s largest multilateral development partner. ADB has committed $2.86 billion in lending, grants, and technical assistance for Cambodia. The country operations business plan, 2018–2020 for Cambodia focuses on improvement of livelihoods and employment in rural areas; investments in national, provincial, and rural roads; climate-resilient infrastructure in provincial and border towns; improved access, quality, and management of upper secondary education and addressing skills gaps; and implementation of the government’s public financial management and decentralization reform programs. 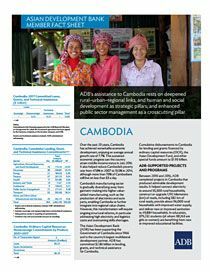 Updated yearly, this ADB Fact Sheet provides social and economic indicators on Cambodia as well as concise information on ADB's operations in the country and contact information.